Writing from Canberra - Despite saying that I don't want to be an "I told you so" I am feeling a bit smug about today's confirmation by the Australian Transport Safety Bureau that an unresponsive crew/hypoxia event seemed the "best fit" for the available information on the missing Malaysia Flight 370. The Australians have been asked by the Malaysians to head up the search for the Boeing 777 that went nordo on a flight from Kuala Lumpur to Beijing on March 8th. 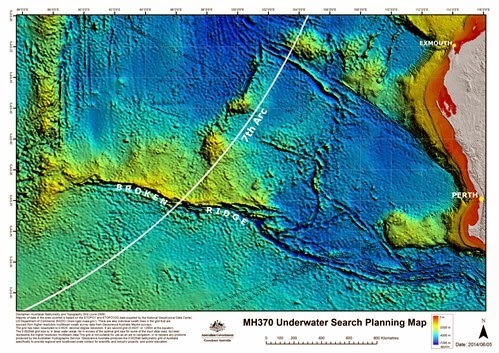 The Aussies have not been asked to work on the "why" of the missing flight, just find out where the plane is now, though I suspect they're itching to get their hands on all the evidence collected so far concerning the greatest aviation mystery since Amelia Earhart. 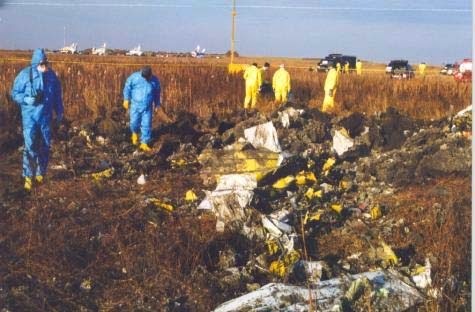 Making the link between MH 370 and other hypoxia-related accidents came as part of a larger compilation of aviation accidents intended to help create a reference base of what happens when a plane drops from the sky; how does its speed change and what is the effect of its impact with the ground or water? These answers became part of complicated calculations giving investigators a revised geographical range for search efforts. That's what the report is about. Having spent five weeks in Malaysia this spring, listening to nonsensical and contradictory statements by the country's then-double duty minister of transport and defense, the show-us-your-cards report by the Australians practically had me weeping with joy. And that was even before I read pages 34 and 35, where the Aussies suggested that hypoxia - my pet theory - was a "best fit." Since day one, I've felt uncomfortable with the rush to pin the mysterious disappearance of MH 370 on the pilots or some unnamed/unknown bad guy on the plane, because there's just no evidence to support it. Read about hypoxia however, how strips pilots of their judgment while infusing them with a sense of well-being and all the illogical events in the missing airliner story begin to make sense. Several years ago I wrote a long article about two high profile plane crashes in which the pilots died from a lack of oxygen but their planes continued to fly; the Learjet carrying American golfer Payne Stewart in 1999 and the crash of Helios Flight 522 in 2005. I spoke to passengers and the pilot of yet another flight that underwent a depressurization and nearly suffered the same fate. We fly through the sky, seven miles above the ground, watching movies or munching peanuts, forgetting entirely that the environment just beyond is inhospitable to life. Only the constant infusion of oxygen rich air keeps us going. That we can appreciate. It is harder to appreciate how quickly a depressurization can strip the best of pilots of their judgment and skill. Without sufficient oxygen, anything they do defies logic. If that doesn't describe some of the inexplicable details of MH 370, I don't know what does. To hear a full blown-account of what I think could have happened on board Flight 370 click here or here. For my (lengthy) article on hypoxia, click here. To learn more about my forthcoming book for Penguin about MH 370 and other accident investigations click here. New information about an initial power loss on MH 370 two hours after take off. Read about it, here. Prior at arriving at that theory, several ones were ruled out, including complete loss of power by icing / bad fuel like British Airways Flight 38. I've listened to your radio piece and I wondered if you would like to say something about depressurization. Are we talking about an oxygen leak from cylinders on the plane or an incident leading to the piercing of the skin of the fuselage or something else entirely? Just finished reading your 30-page article on hypoxia. Very interesting and surely relevant to the case in hand. Dear "Anonymous": First of all, cabin oxygen does not come from "cylinders on the plane." It comes from pressurized bleed air from the engines. It would require a loss of both engines to lose bleed air cabin pressure (although it might be necessary to descend to an altitude at which pressure could be maintained by one engine). Second, the altitude deviations that were reported initially have been shown to be erroneous. That goes for the ostensible climb to 43k' and subsequent descent. This is not the anon you are replying to, but another one. Afraid you are not quite on the mark there. Cabin air is as you said, bleed air from the engines / compressor. However, the emergency air system (in the event of cabin pressure failure) is powered by an on board oxygen system. In the grand old days, oxygen for passengers was created by generators that when it is ignited (triggered) gave off oxygen. That is the generators that caused the Valuejet crash when it ignited in the cargo hold. Oxygen for the flight crew is provided via tanks in the cabin, and routed through oxygen lines. Please see the Egyptair fire to see how that is the suspected cause of the fire that destroyed the plane on the ground. In order to incapacitate the crew it had to be more than just depressurization, which would have been routinely (they trained for this) handled by immediately donning oxygen masks and then dropping the plane to about 10,000ft where there is sufficient air to breath without pressurization. Passengers would be faced with masks dropping automatically upon depressurization and can do the same. The failure had to be also of the pilot / crew oxygen system as well as depressurization. Well, the most likely cause of something like that is a similar incident to the Egyptair fire which destroyed both the crew oxygen system and opened a hole that depressurized the plane. I addressed my comments to the author of the blog, C. Negroni, not to you. Many thanks, btw, to not-at-all-grumpy (other) Anonymous for informative and interesting comments. "Are we talking about an oxygen leak from cylinders on the plane or an incident leading to the piercing of the skin of the fuselage or something else entirely? " An oxygen leak like Egyptair is suspected. It can also be a fire that started inside the oxygen hose / system in the pure oxygen atmosphere. Either case, it would result in a fire that rapidly goes out of control, burn through the skin. This fits with the Vietnamese oil rig eyewitness account of a flare like flash that went out quickly. It also follows that the crew would not have oxygen so it is not a simple decompression incident but that and a failed pilot oxygen system. It is not a question of whether passengers had oxygen, but rather whether the two guys at the front who count were incapacitated in the 30-40 seconds of useful consciousness after MH370 depressurised which matters most. More importantly what else other than a cockpit fire could have prevented pilots from using their personal oxygen supply to dive the aircraft to safety? Christine what has confounded this investigation have been false leads planted by the Malaysian Government owned Press media in the first weeks of this disappearance suggesting a zig-zag path. In the fullness of time these will be proven to be lies. Already it is apparent that the so called Lido hotel radar image was a photo-shopped hoax. The issue which the hypoxic crew scenario struggles with is first turn back from Vietnam had to be deliberate. All modern airliners are flown by autopilot from take off to landing especially at altitude where flying by hand is not an option. The first turn back appears to have been a deliberate act and logic suggests they intended the had electrical problems and directed the autopilot to head back for Kuala Lumpur. Whatever catastrophe they had must have occurred after thei turn back. What has been concealed for 9 months is that a further transponder signal was detected from MH370 east of Malaysia at 17:50 UTC (1:50am MYT). This suggests MH370 turned back from Vietnam about 15 minutes after passing IGARI. If the crew were incapacitated flying back then the autopilot would just keep flying a Rhumb line following the last magnetic heading it had. This would take it almost to the 19:40 ping arc and then the local magnetic variation would have curved the flight east towards Australia over several hundred miles. This explains in a simple way how a hypoxic incapacitated crew flew an unusual curved route without any need to speculate about pilot suicide.